... Or Download And Print Them! Looking for Unique Baby Shower Invitations? Find all types of invitations for unique baby shower themes. 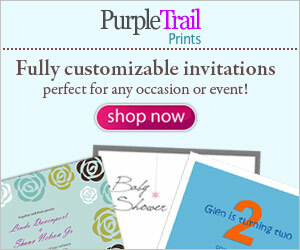 Order and personalize your invitations online, print them out for free or make your own homemade shower invitations. Also, learn how to make digital shower invitations right on your computer (video instructions below). When deciding on which invitations to choose, keep your baby shower theme idea in mind. Rest assured there many basic boy or girl invitations, but there are also themed invitations to coordinate with your shower and many selections to choose from. Add some fun to your invitation by including a photo of Mom-To-Be (or Mom and Dad-To-Be if it's a couples baby shower). Does Mom-To-Be have a picture of a recent ultrasound? See "Baby Shower Invites Personalized" below! Be sure to check out our selection of free baby shower invites (see below). Download one of your favorites right now, or sign up for our newsletter for periodic new designs ... And get access to our complete free baby shower invitations library in our back issues! From basic designs to unique personalized designs, buy or hand-make your shower invitations! And ... we are always adding to our collection of unique invitations and seasonal cards ... ideas for holiday and seasonal shower invitations too. Is Mom-To-Be ... innovative, trendy, chic? Then check out our Unique Baby Shower Invitations. Again, send the invitations out at least 4 weeks before the baby shower. Of course, the sooner the better. And be sure to include the date, time, location, an RSVP contact with phone number, and directions (a detailed map is always a good idea). Also include Mom-To-Be’s one or two registry information. Personalized Shower Invitations give you the ability to create unique personalized invitations at the click of a mouse ... it's easy and fun! And, we've included a special twist to show you how to convert any special occasion or holiday card into a memorable baby shower invitation! Baby Shower Invites Personalized per your order ... order photo shower invitations and don't forget to tell Mom-To-Be about ordering personalized baby photo announcements! Find Lots more personalized and photo invitations on our Invitations For A Fall Baby Shower page, and Invitations For A Halloween Baby Shower page. If you Love Fall and Halloween, You'll definitely love these awesome invitations! Having a Christmas Baby Shower? Another great holiday to share your new "Special Blessing" with your family and friends. We have some Verry Merry "Santa Baby" shower invitations on our Holiday and Christmas Baby Showers page! For more Holiday Themes and Seasonal Baby Shower ideas to use throughout the entire year check out our Unique Baby Shower Themes. 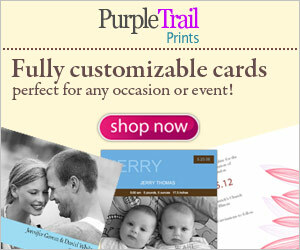 There are many different companies to choose from for invitation ideas. We are always researching and found these Awesome invitations ... Take a Peek at Unique Invitations For A Baby Shower! If you're looking for that special baby girl or baby boy invitation check out our newest Baby Girl Shower Invitations and our Baby Boy Shower Invitations. Cute invitation designs to get your celebration started! A great economical way to make your own invitations ... use scrap booking supplies! A hand made invitation adds that personal touch that will definitely impress your baby shower guests. Do you have extra supplies around the house? Tip: Using scrapbooking supplies to create invitations? Check out these adorable scrapbooking supplies at TwoPeasInABucket.com. Learn more ways to make your own Homemade Shower Invitations. They're not only fun to make, but they add such a special touch. How awesome are hand made invitations for your guests. And you can even personalize them! Be sure to visit Two Peas in a Bucket's Cardmaking Gallery as well (link below). They have many unique baby shower ideas, especially for our Scrapbooking Shower Theme in our Baby Shower Theme Ideas. Make Your Own Digital Baby Shower Invitation! Would like to learn how to make your own baby shower invitations using an image application? Click on the image below to be directed to a wonderful video tutorial on how to make your own baby shower invitation! Find thousands of ideas and supplies for all seasons and homemade invitations at Two Peas Cardmaking Gallery! Do you have a big family? Maybe one in diapers and one graduating from high school? This is an adorable graduation announcement and also something to think about for your baby down the line. Personalize it now! We’ve also created our own Free Printable Shower Invitations, which you can download and print. And ... we also have Free Postcard Invitations by Sacco Bambino ... a less formal and very convenient option for unique shower invitations. They all coordinate with our Sacco Bambino® Unique Baby Gifts collection! A brand new line of Printable Shower Invitations. Print as many as you need for Only $2.99! baby shower invites. They also carry birth announcements! Keep updated on all of our specials and promotions ... including our Free Baby Shower Invites Library, only for VIP Subscribers! Periodically, we include a uniquely designed invitation for the upcoming season. Whether it's a holiday or a special event to celebrate your baby shower, we have designs geared towards the next season! See What Else You Get When You Keep In Touch!